MIHAIL KOGALNICEANU AIR BASE, Romania (July 24, 2008) -- About 900 U.S. Soldiers are now beginning their final week of training with Romanian troops at ranges in the eastern half of this former Warsaw Pact nation. 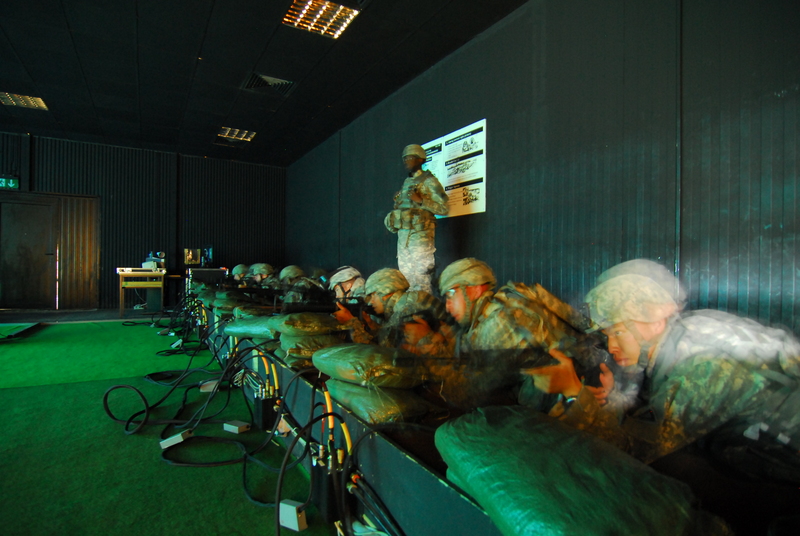 The month-long training at MK Air Base, under Joint Task Force-East, has already included an airborne operation, live-fire exercises at squad level, military operations in urban terrain, joint patrolling, situational training exercises, and medical training. Soldiers train on the Engagement Skills Trainer 2000 at Mihail Kogalniceanu Airbase, Romania. Some 900 Soldiers are now in Romania, as part of Joint Task Force - East, to conduct training there with members of the Romanian military. The training under JTF-E is part of an initiative to strengthen relationships between the United States and its Eastern European allies, officials said. They said this is the second year training has been facilitated by JTF-E -- the first rotation, a "proof of principle" demonstration, happened last year. This month's training in Romania is actually the first part of this year's JTF-E rotation. Beginning in August, JTF-E will facilitate multi-national training for additional U.S. Soldiers in Bulgaria. Training there will last until November. The training in Romania involved Soldiers from U.S. installations in Germany, along with members of the New Mexico National Guard and the Utah National Guard. Also included were 280 soldiers from the Romanian Army's 21st Mountain Battalion and 200 soldiers from the Bulgarian Army's 10th Company, 5th Infantry Battalion. Spc. Eric Trujillo and Sgt. Adam Ortega, part of the New Mexico National Guard, were among those participating in military operations on urban terrain training at Babadag Training Area -- a range about 35 miles northwest of MK Airbase. During the training, their units entered an area held by an opposing force -- played by Romanian soldiers -- and attempted to secure the area and capture a high-value target. To accomplish their mission, the Soldiers used weapons similar to what they might use in Iraq, but were instead loaded with "simmunitions," non-lethal projectiles with a paintball-type marker. Trujillo said the Romanians made worthy foes. "As the OPFOR, our opponents out there -- they gave us a run for our money," Trujillo said. In fact, the Romanians performed their role as the opposing force so well, the New Mexico unit was unable to acquire their target. But that didn't stop the unit from performing well in the other areas of their mission. "We didn't get our suspect, but we did good," Ortega said. "We moved as a good element across the field, clearing the buildings we had to do, and pushed through this whole village and we did good." Ortega said he thinks the training in Romania is good for units who will deploy downrange, and he should know, he recently returned from Iraq. "It's really good three-dimensional warfare here; we are out in the open and we get to practice our 360-security all the time, every movement we make," he said. "We always have to be watching to our left, to our right, to our rear. And it's good -- especially for these new guys." Right now, the presence of the U.S. military in Romania and Bulgaria is small, but the Army is constructing billeting, unit operations, maintenance support, and recreation facilities on the former 34th Mechanized Brigade Base to support and house about 1,700 Soldiers, said George Bostick, the deputy commander of JTF-E.
"We are building a permanent forward operating station here," Bostick said. "It's important for us for the quality of life for the Soldier. If we are going to be here over an extended length of time, we have to get them out of bunk beds. We are building an installation -- a kaserne -- like we have in Germany for our Soldiers. At the end of the 2008 round of training, JTF-E will begin planning next year's training and will continue to work on developing and maintaining facilities in both Romania and Bulgaria, Bostick said, including improved support facilities for Soldiers.